The Annual Issue for February wasn’t a style, but a collection of ready-made characters and monsters created using the recently released Character Artist 3 (CA3) add-on for CC3. Although I recently purchased this add-on, I’d never used it, so this month’s Challenge seemed like the perfect opportunity. Using CA3 is pretty easy; you simply use the various symbol sets, which are organised into various race types, and then into various regions of the body. Each has a range of the expected (i.e the body-part!) symbols, as well as clothing, weapons and other gear as appropriate. You simply build up your character portrait by selecting the symbols you want, which are cleverly placed on sheets to overlap in a realistic manner. There is a huge range of symbols, and most come with a varicoloured option, so in essence the choice is endless! 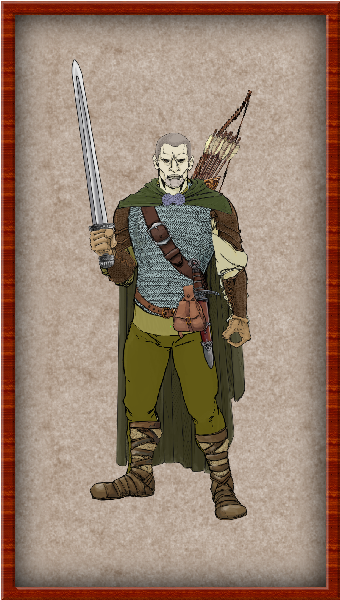 Just for the record, he’s a half-orc fighter, and actually also my first 13th Age RPG character/NPC that I’ve created for my developing Havenscoast campaign. If I get a chance I’ll post his character sheet as well.